This MAb reacts with a protein of 22 kDa, identified as β sub-unit of HCG. This MAb reacts with a protein of 22 kDa, identified as β sub-unit of HCG. It does not cross react with the α sub-unit. HCG is a glycoprotein, which is secreted in large quantities by normal trophoblasts. It is present only in trace amounts in non-pregnant urine and sera but rises sharply during pregnancy. HCG is composed of two non-identical, non-covalently linked polypeptide chains designated as the alpha and beta subunits. The alpha subunit is identical to that of thyroid stimulating hormone (TSH), follicle stimulating hormone (FSH), and luteinizing hormone (LH). hCG MAb detects cells and tumors of trophoblastic origin such as choriocarcinoma. 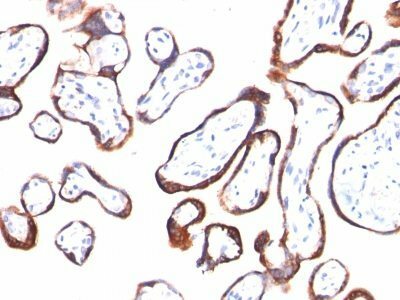 Large cell carcinoma and adenocarcinoma of the lung demonstrate anti-hCG positivity in 90% and 60% of cases respectively. 20% of lung squamous cell carcinomas are positive. hCG expression by non-trophoblastic tumors may indicate aggressive behavior. Catalog number key for antibody number 0054, Anti-HCG Beta (HCGb/54) The prefix indicates conjugation, followed by the antibody number and size suffix.